The Kewanna-Union Township Community Endowment Fund provided a grant of $1,000 to the Kewanna Food Pantry. The grant will be used to purchase a freezer that will allow the pantry to offer additional perishable items to their clients. From left: Community Foundation intern Kennedy Niedbalski, Kewanna Food Pantry volunteer Aaron McCombs, Community Foundation board members Larry Cunningham and Linda Leasure, and Executive Director Jay Albright. On August 2, 2018 the Fulton County Community Foundation (FCCF) awarded three grants to local nonprofit organizations through the Kewanna-Union Township Community Endowment Fund. The fund was established in 2010 by Kewanna H.E.A.R.T. to provide support for charitable programs and projects within the Kewanna-Union Township community. The FCCF awarded the Kewanna-Union Twp. Public Library $500 to aid in the purchasing of a sound system and microphone to be used during events. The library has a full schedule of programs and events for the community, and the new equipment will help to provide worthwhile experiences for attendees. The Fulton County Community Foundation awarded $600 to the Kewanna Youth League in support of the youth summer ball programs. The Kewanna Youth League had not been active for a few years but was revived this past summer. The organization is excited to continue this youth-oriented program and looks forward to future seasons! 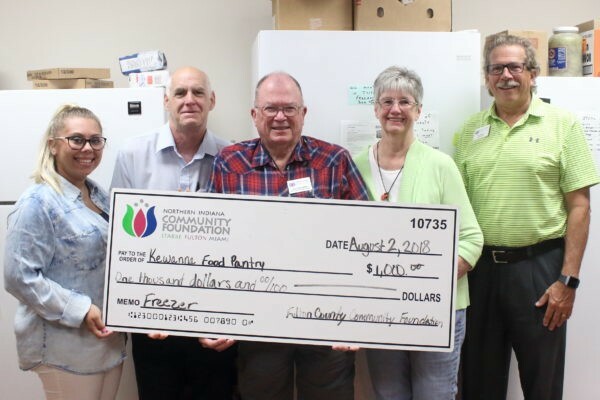 The Kewanna Food Pantry was awarded $1,000 for a new freezer. The food pantry originally started with a few shelves in the Kewanna United Methodist Church and has grown tremendously since then. The new freezer will help meet its growing needs as its community outreach is expanded.